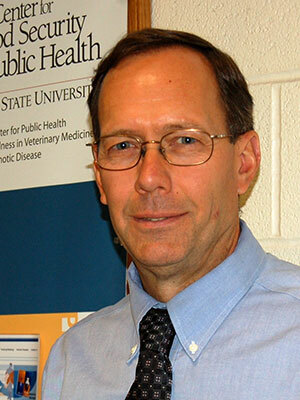 Jim Roth is a Distinguished Professor and Director of the Center for Food Security and Public Health in the College of Veterinary Medicine at Iowa State University. He received the DVM (1975) and PhD (1981) degrees from ISU. Dr. Roth currently focuses on Secure Food Supply projects; working with state and federal officials and industry in planning for optimal responses to transboundary and emerging diseases that threaten the food supply or public health Dr. Roth received the Distinguished Veterinary Immunologist Award from the American Association of Veterinary Immunologists, the Distinguished Veterinary Microbiologist Award from the American College of Veterinary Microbiologists, the Public Service Award from the American Veterinary Medical Association and the USDA APHIS Administrator's award for lifetime achievements in animal health. He has testified before Congress on biosecurity preparedness, on efforts to address bioterrorism and agroterrorism, and on the need for vaccines for foreign animal diseases. Dr. Roth served on the National Science Advisory Board for Biosecurity since its inception in 2005 until 2014. Factors leading to increasing rates of emerging and re-emerging diseases will be explored. The importance of integrating disciplines to study and to develop methods for control of these diseases will be examined. Examples of currently emerging diseases will be included in the discussion.